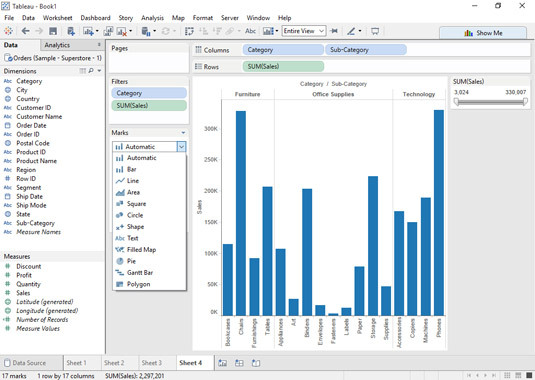 In Tableau, the Marks card provides you with control over how the data is displayed in the view. The options on this card allow you to change the level of detail as well as the appearance of the marks without affecting the headers built by fields on Columns and Rows. Take a look at the Marks card drop-down menu. You can select the type of mark that you want displayed by choosing one of the options from this list. 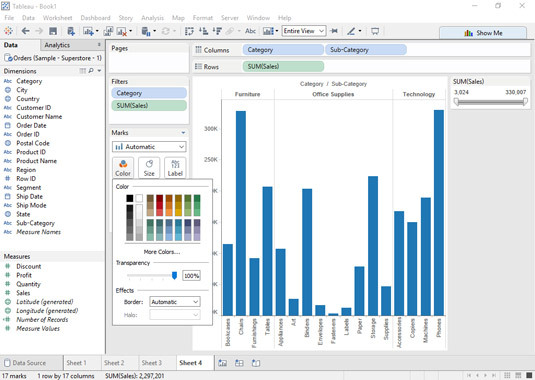 In most cases, you will want to leave it set to Automatic and let Tableau decide on the best Mark Type for your visualization. Use the list to choose the mark type. The Marks card is also where you can change the Mark properties with different options depending on your selected Mark type. The Color, Size, Detail, and Tooltip properties are always available; others that you might see are Shape, Angle, or Path. Clicking on a property will bring up options to customize the marks even further. In many cases, more than one field can be used for a given encoding option — if you wanted both Sales and Profit as labels, for example. But if you want to add a second field to the Color control, you need to hold down Shift as you drag the field onto the control. The Size and Shape controls can only have one field added to them in a view. By default, Tableau displays a tooltip when you hover the mouse pointer over a data point in the view. This tooltip provides information about the data that’s being displayed. You have the option of editing both the content and the appearance of the tooltips. 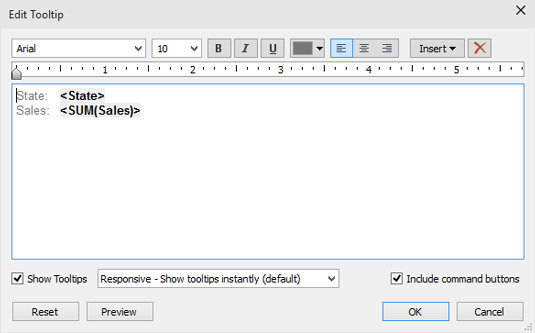 To do so, click the Tooltip control to display the dialog box.